Both sides use the relief to review the current position against their plans for the campaign. The Axis plan called for all forces to converge on Moscow with a view to surrounding the city and capturing this vital hub. The Axis came very close to achieving this. The northern hook with the shortest route to the objective met the stiffest opposition but managed to batter through and gain a narrow corridor north of the city hooking around at the rear, The southern pincer marching in a wide arc against limited opposition cut through the Soviet front line and drove north in a wide sweep around the rear of Tula and came within a hex of contacting the northern forces. For the briefest of moments Moscow was cut off but the rains came just one turn too early for the German panzers and the tanks mired, separated and unsupplied then needed to fight out for their survival and meeting a scratch relief force just south of the City escaped back to the western side of the strengthening Soviet MLR. By the time the winter snows covered the ground the Axis forces were in control of 2 hexes of the city with a front extending from just West of Narva, around Pskov, up through the Valdai and around the west of Kalinin. From there protruding to two hexes over the upper Volga canal, and then straight south, east of Orel, Kursk, and Kharkov to the coast. At Mariupl. The Crimea was still in Soviet hands and Odessa remained defiant. All this had been achieved at very little cost with no eliminated divisions and only a handful of Stug and flack/Mot At units in the replacement pile and a good stock of accumulated RPs. The Soviet Winter Counter Offensive changed that, The Axis were pushed back in the centre holding finally just west of Kursk and east of Orel. In the north the ignored Leningrad front exploded with a Soviet Offensive which has taken them to within a hex of the main arterial supply route to Moscow which even now is still in some danger. However the winter battles have not been all one sided and by sheer force of arms and good use of engineers and massed artillery the German forces at Moscow have captured 2 more hexes of the city and invested a third. 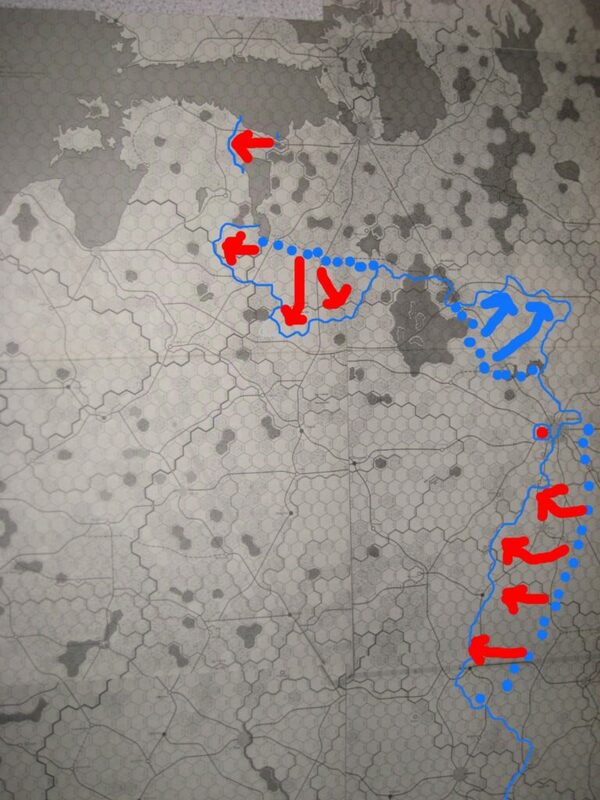 More spectacularly just north of the former capital an opportunistic attack at Kalinin taking advantage of the Soviet’s poor supply lines ripped open a breech which has allowed the Axis to move north some 100 miles and threaten Leningrad’s direct rail line to the East. Despite these successes the Soviet offensive has taken its toll with 6 German infantry divisions in the Replacement pool and as many more cadred and with 4 panzer divisions similarly reduced. RPs are less than half their pre offensive levels and insufficient to replace more than 5 divisions total. The Soviet plan by its very nature was reactive but consisted of a series of defensive lines to be given up with increasing levels of resistance. From the start the tactic of massing the armour behind the lines rather than dissipating it for AECD worked well and a rolling battle developed along the Moscow road which came close to preventing the German forces reaching the city. If the tankers has been positioned even further back it may have been possible to rescue even more of them for the defense but the large pocket east of Bialystok trapped too many.. Nevertheless although Soviet losses were high enough troops were saved and the forces held pretty much along the final planned MLR. The exception being the bulge north of Moscow and the loss of the city hexes themselves. Odessa now given Hero city Status remains in Soviet hands but the easy collapse of Sevastopol marked a black point in the defense of the Crimea. The loss of Kalinin and the advances there however marked the major failure of the Soviet plan to hold the invader at bay along the originally planned stop line of the retreat. The Soviet Offensive, The plan here was ambitious and while the initial shock gained some ground quickly the plan of reaching Bryansk proved far too ambitious. Ultimately local commanders were unwilling to sacrifice their scares mobile forces in exploitations and the attack was more of a slow grind. Still at this point the targeting of German mech forces and divisional grouping caused severe losses to the German side which they will struggle to make up in the short term. The northern attack although smaller and on a narrower front gained great tracks of land initially and has come within a hex of cutting the main arterial route to Moscow, however this prize continues to elude the Soviets. The Soviets successfully held the Finnish forces at bay in the south by the amazing exploits of the 10th Mech but neglected the north to their cost and the recent loss of Murmansk could have been avoided.